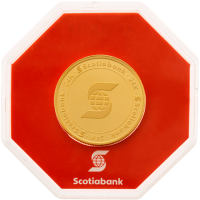 Buy 1 oz Scotiabank Gold Rounds | ?? 1盎司丰业银行金圆 Produced for Scotiabank by Valcambi, one of Switzerland's best know private refiners. This round comes in an individually serial numbered assay card in the shape of an octagon that has been signed by Valcambi's Chief Assayer.